Vacation is over, and it feels good to get back into the groove once again. I finally finished up this painting of one of my "dress" shoes. The right one I believe. It's from a batch of photographs I shot for the recently completed Chicago commission. 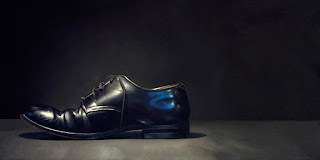 While I was in the midst of composing the image for the theme of "Family" I took a number of shots of my shoes alone. I came up with quite a few compositions that work pretty well, and depending upon how this one is received, I hope to return to that folder of images, and paint more along this line in the future. I'm currently working on another of my large (24 x 24) mixer paintings. I bought a really cool looking Hamilton Beach off of ebay a while back, and have been anxious to paint it. I finished the first pass today, and as always, I'm a little distressed about how it looks. This happens with every one of my paintings, so I'm remaining optimistic that it will turn out to my liking in the end. I haven't decided where I'll be sending either of these as yet. I may just stockpile a number of new paintings, then make the decision as to where to send them. I think this may have been my longest time frame between posts, but the Hollingsworth's have been at sea. Karen and I have discussed many times how it seems all we do it work. Pleasurable work, but work nonetheless. Even our vacations seem to always include a lot of time spent working on photography for future paintings, so Karen came up with a plan. The next time an opportunity to do something "fun" is presented to us, we'll stop what we're doing, and participate. It wasn't long after that proclamation that we got a call from Jeff and Leslie Cohen with an inviation to come with them on a cruise. They got the cruise bug about a year ago, love it, and really wanted us to join them. I never saw myself as a cruise person, but they were convinced that if we tried it we'd be hooked. We had to make up our minds quickly, because they were leaving in like four days, so agreeing to abide by our vow to "do the next fun thing" we came aboard. The cruise was a short one. Mobile to Key West and back. The swine flu outbreak in Mexico had forced Carnival to rework many of their itineraries, so this cruise formerly scheduled to dock in Cozumel, was rerouted to Key West. Which was fine with us, since we had already been to Cozumel, and had never been to Key West. The size of the ship was pretty impressive, but then the Cohens told us that it was one of the smaller ships in the fleet. It seemed big to me. The process of getting everyone on board at the terminal in Mobile worked like a well oiled machine, and in no time we were on board. Karen and I spent the next couple of hours checking out the vessel, tracking down Jeff and Leslie, and getting something to eat. Before we knew it we were underway. I must admit, heading out of Mobile into open ocean was pretty exhilarating. 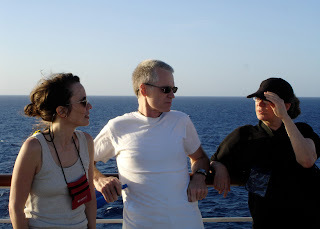 The water was smooth, an amazing deep blue, and the weather perfect for our voyage. 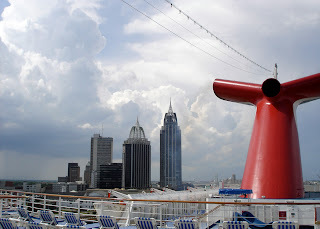 That night, and the following day was spent doing some of the "cruisie" things, eating a lot of good food, and hanging out on the promenade deck just marveling at the sea. The next morning we awoke in Key West. The one thing we all wanted to visit was the Hemingway House, so that was our first stop. I think Karen's favorite aspect of that visit were the many polydactyl cats that live on the grounds. As much as I enjoyed the cats, I think his studio was my favorite spot. I haven't read that much of his work, but there is something about viewing the space in which creative people work that intrigues me. We visited the Art and History Museum next, then it was back on board for lunch. After that Jeff, Leslie and Karen wanted to hit the beach to swim, while I wanted to continue my personal itinerary which included the Audubon House, and the Mel Fischer Museum. We all regrouped around five for our departure back to Mobile. 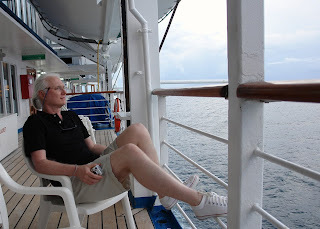 The cruise back was very relaxed with a lot of the day spent just "chillin" on the promenade deck. All in all, I must admit that I had more than a pretty good time, and we plan to do this again in the future. It was nice to truly get away for a little while, and just "be". Next time I think it would be nice to head deeper into the Carribean, and do a little diving. Next time. Now we're back home, and that means back to work. I've got the better part of a small gallery painting done, and the drawing for a second ready to begin. I'll post the image of the first in the next day or two. My plan was to post this on Friday night, but it wasn't finished to my satisfaction. So, I decided to work on it some more over the weekend. I'm glad I waited. The additional work made a big difference. In addition to this I completed the update to my website, and also worked on drawings for new paintings intended for the galleries. The problem I'm having now is choosing my favorite compositions. Sometimes I have so many "good" images to choose from, that it's difficult to make the decision of which ones to actually paint. Or at least which one to do first. 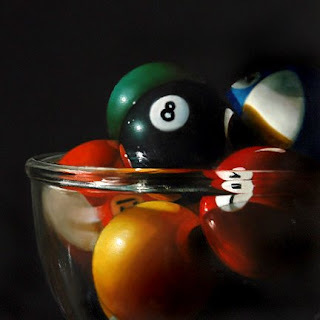 My internal dialogue usually starts with, does it satisfy my own creative needs, then works its' way into the compositions marketability, and potential to please the gallery. In the end, it's usually a combination of the three. Hope I make a good decision with this current batch. If you'd like to bid on the painting above, you can access the auction by clicking here.